After losing quite a bit of market share in the past few months, Blackberry is hoping for a revival with the newest generation of phone’s they’ve launched; the Q10, Z10 and the Q5. The Blackberry Q5 is all set to be launched in the Indian market in the coming few days, and priced at 25,000 INR, we help you decide if the phone is worth paying the price for. As far as competition goes, there aren’t many phones in the market at this moment which directly compete with the Blackberry Q5, which tends to suggest that the phone might be a hit-or-a-miss type of device, since it’ll be bringing a new form factor to the table. Whether or not people accept this is the big question. The Blackberry Q5 comes with a rather disappointing 5MP camera. This unit can take pictures at a maximum resolution of 2592х1944 pixels, and is assisted by autofocus on the software side and LED flash on the hardware. There’s no BSI sensor, so you can expect low-light imaging to be sub-par. This 5MP unit can also shoot videos at full HD (1920x1080p) at 30 frames per second. The front camera on this touch and type device is a 2MP shooter whose primary job would be to assist video calling. This unit is also capable of doing 720p video, which is quite good by a 2MP camera’s standards. The phone comes with 8GB of on-board memory, which can be extended up to 32GB by using an appropriate microSD card. Although only a few buyers would feel the need for more in-built storage, a 16GB internal ROM would have been a better idea. This new device from Blackberry features a 1.2 GHz dual core processor from Qualcomm. For the cost, we definitely expected more. 25,000 INR is not a small amount by any means, and the 1.2 GHz dual core processor honestly does not do justice to the price tag. However, what might be considered as consolation is the fact that the phone comes with 2GB of RAM, which means the phone will be one of the smoothest ever, smoother than most Android phones thanks to the better CPU utilization. The battery on this device is a respectable 2180mAh, which, considering the screen size is definitely a pro for the phone. 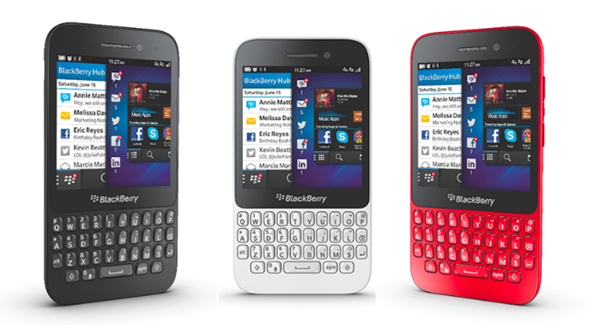 Blackberry phones have been known to provide below average battery backup, and we hope things change with this release. The Blackberry Q5 will come with a rather unique display, which measures 3.1 inches diagonally and packs a resolution (again unique!) of 720×720 pixels. This, in turn, makes a very respectable PPI of 328 pixels per inch. However, we doubt that the phone will be used for multimedia since many lower cost phones with bigger screens are available, which would suit multimedia users better. The primary use of this phone like most other Blackberry phones would be business. The display would be IPS LCD, which means, apart from a good, tight PPI, the phone will also offer wide viewing angles. As mentioned earlier, there aren’t many competitors to this phone per se, but given the price range and the form factor (touch and type), there can be a few. The touch and type form factor isn’t widely popular in this date. The phone can compete with it’s own elder sibling – the Q10, and maybe the much lower priced HTC ChaCha which comes with Android instead of BB10 like the Q5. The Q5 does seem like a device which will be forgotten by the masses sooner rather than later. Although the phone does pack decent specs, but the price tag is what will put off most people. It should be kept in mind that a market like India is extremely price sensitive. We hope to see better releases from Blackberry in the near future, with the hope of a price tag better than what we saw on the Q5.